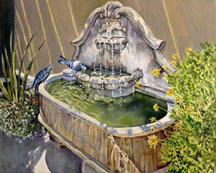 To get on mailing list or check availability and price on paintings, commissions, giclée prints. ..
Email me to get on event notification list! For upcoming and recent exhibitions, see "Biography"
It is our pleasure to offer you the highest quality fine art possible. Please remember that all images on this site are copyrighted by Sharon Mills; no copying, pasting, extraction or other means of reproduction is legal without the express written permission of the artist.